Firebolt is a common Intelligence action card. It is part of the Core Set. 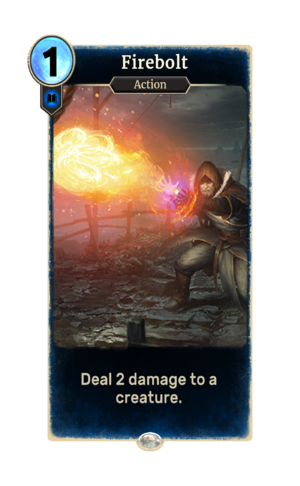 In addition to the card's availability in the Core Set, three copies are included in the Ancano's Cunning theme deck, three copies in the Brynjolf's Heist theme deck, three copies in the Dunmer Avengers deck, and two copies in the Telvanni Ambition theme deck. The Firebolt spell first appeared in Skyrim. The card was earlier known as "Lesser Fireball" in development, and the earlier art was created by Nuare Studio.